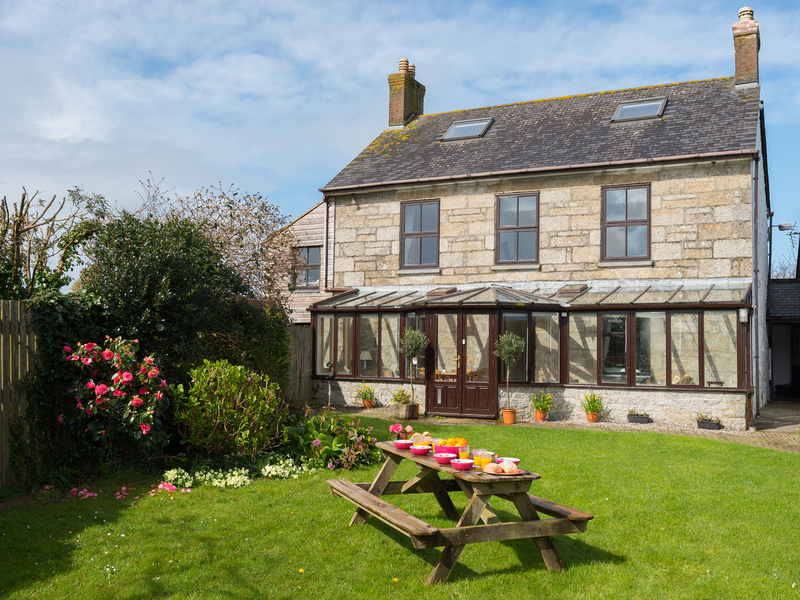 St Michael's Farmhouse is a lovely farmhouse located near the village of Penzance in Cornwall. Hosting four bedrooms; a family room with a double, single, and an en-suite, neighboured by a king-size, and a twin with basin, a double, along with a bathroom and a shower room, this property can sleep up to eight people. Inside you will also find a kitchen/diner with breakfast bar, a utility, sitting room with woodburner, and a sun room. To the outside is off road parking for four cars, lockable bike storage, and an enclosed garden with furniture and a barbecue. Located in a lovely setting with much to explore, St Michael's Farmhouse is a heart-warming retreat in a relaxing part of England. Oil central heating with woodburner. Electric oven and hob, microwave, fridge/freezer, washer/dryer, dishwasher, additional fridge/ freezer in utility, TV with Freeview, WiFi, selection of books, games and DVDs. Fuel, power and starter pack for fire inc. in rent. Bed linen and towels inc. in rent. Stairgate, highchair, and travel cot. Off road parking for 4 cars, 1 x car in garage and 3 x private layby opposite. Enclosed garden with furniture and BBQ. One well-behaved dog welcome. Sorry, no smoking. Shop and pub 1 mile. Note: Sloping ceilings in family bedroom.